The ShanghaiTex 2015 was successfully held in Shanghai Pudong New International Expo Center from June 15th-18th, 2015. 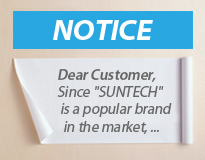 Suntech strengthened its leading position in designing & manufacturing on textile machines for weaving & finishing units, especially for Tensionless Knitted Fabric Inspection Machines. Our machines appealed to thousands of customers from all over the world. We have successfully sold the machines to our Indian and Pakistani customers at USD200,000 on site.